Get this new from Roseli Bakar blog... You can get a free pass . Thank you Roseli for sharing this information. Tan Yang Po has transformed a business from US$3 million to US$128 million in just 5 years, spanning a network over 52 countries. She was also the Director of Yves Saint Laurent Beaute, Asia Pacific. During that time, she oversaw 22 countries in the region. 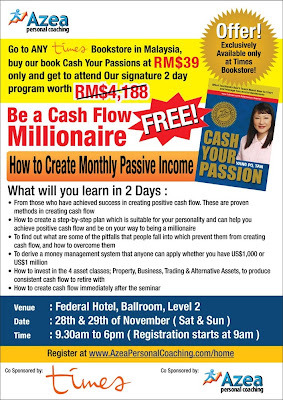 Yang Po authored the book, “Cash Your Passion: What Text Books Don’t Teach About How to Start and Manage Successful Businesses”. Yang Po now owns 2 businesses – Azea Personal Coaching and Azea Property Investment. 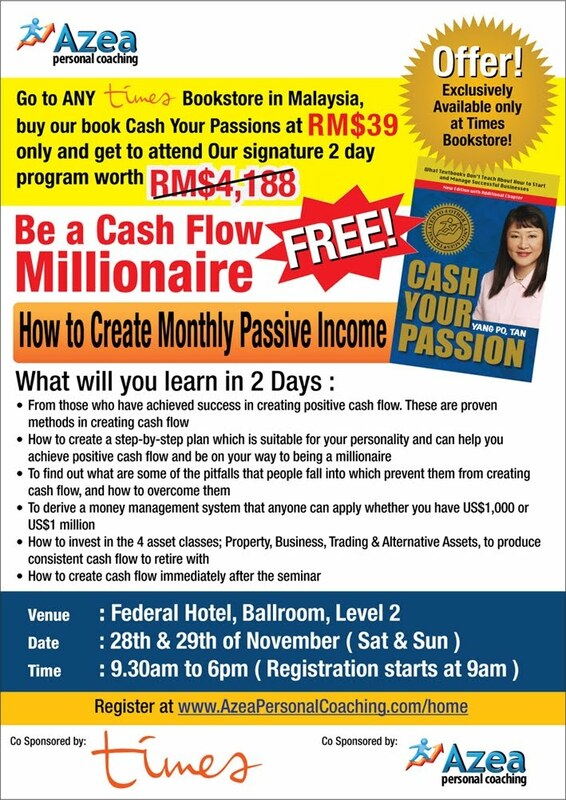 Go to Be A Cashflow Millionaire Registration Page or call 02- 6532 2920 and attend the inaugural “Be A Cashflow Millionaire” 2-day signature program worth RM$4,188 at absolutely NO COST!! A FULL house is expected! You ONLY have 1 WEEK to do so. This opportunity might not come again. Seats are very very LIMITED! Go to Be A Cashflow Millionaire Registration Page or call 02- 6532 2920 and get your Be A Cashflow Millionaire ticket worth RM$4,188 NOW! Note: You need to do this to attend the seminar for Free. Enter reference “Brennan Khor” under “Please fill in friends name” to attend the program at NO COST now!